Adam Sambola, the creator of "RedBean" the Crawfish, is a born native of Louisiana. Adam's paintings are inspired by Jazz and Blues, his background in masters and religious paintings, and his love for southern seafood. "RedBean" has attracted collectors throughout the country and throughout the world, and is a festival favorite. Locally, Adam's "RedBean" character is a Mascot for Louisiana's Cajun Culture. 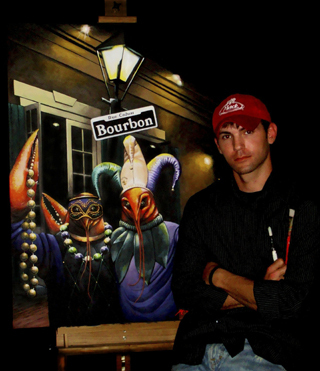 Adam’s desire as an artist is to continue searching for new ways to bring the imagination into "RedBean's" Cajun world.